We offer a wide range of dance classes to suit all levels of dancer. From pure beginner to advanced dancer, we have the right class for you. Within a relaxed, fun environment we tailor our classes to ensure you improve your dancing whilst also having a great time. 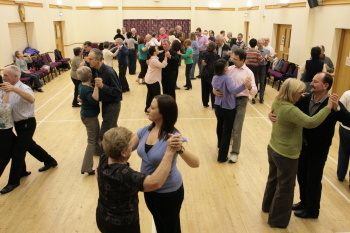 For the beginner, we teach you all of the basic steps in each dance that you will need to get you dancing. As you progress, in addition to the extra steps you will learn, we also develop your style. And for our advanced dancers, although the steps, style and technique become more challenging we guarantee you will have just as much fun as when you first learnt to dance. If you are unsure of which is the most suitable class for you, please have a look at our explanation of each class or contact us for guidance. If you are a single dancer, please contact us before you join us for the first time. Here is our regular timetable of Classes. See our full listing of all our weekly events.